Google Ads, formerly Google AdWords, is Google’s pay-per-click platform whose ads display on the very top and bottom of Google’s search results. It generates aproximately 20% of all clicks in a given search query (percentage is an estimate and not officially disclosed by Google) from all results, both paid and organic. In a different article, we delve into what it takes to build a great Ads campaign structure. This advertising platform was born on 2000 and throughout the years it has evolved towards the mobile reality since more than half of all searches are performed from a mobile device. Google Ads is considered the most effective inbound marketing channel. Inbound marketing is when the user is looking for our product or service. Outbound marketing, on the other hand, is when we are looking for the prospective customer and do so by sending letters, postcards or advertising in social media channels. Inbound marketing channels, in most cases, yield a greater return on investment than outbound marketing channels. In another article titled ‘How to advertise on Google’ we delve into why Ads is the best marketing channel for small businesses. In this article, we tackle what is Google Ads and how it works. We start from the potencial customer looking for something she needs in Google. Let's take as an example this search query: Car paint shops in Los Angeles. It's important to get a good grasp on the search query, also known as keywords, given its central rol in how Google Ads work. Google Ads is all about the search query - search queries are what all other elements gravitate towards. Prospective customers search for something on Google using certain terms - the so-called and famous keyword. Based on the terms that prospective customers are likely to type on Google, advertisers now come up with a list of them, the so-called keywords, and assign the cost they're willing to pay for each of them. The more relevant to the business, the higher the bid. Given how important keywords are, they usually contain a call-to-action wording as it signals purchase intent such as: buy and/or similar wordings. A typical keyword a retail apparel business would likely bid on would be buy fashion shoes nearby me for instance. The advertiser comes up with a list of terms. When somebody writes them in Google, the ad copy can show up and upon being clicked, generates a cost. Google matches the search query with the keywords present in the Ads’ advertiser keyword pool. If a match is found, Google will run an algorithm aimed at determining relavance and quality, also known as the keyword quality score, alongside the bid placed by the advertiser. Since there is only room for up to four adverts on top of the search results and up to two below them, the algorithm will determine which 6 keywords have the highest quality score. Ads will then place their corresponding text ads in the search results page accordingly. The user has now an option - or better yet, up to 17 options, 17 results in the first page for her/his search query. 4 ads on the very top, followed by 10 organic results followed by up to three additional text ads on the bottom of the search results page. If Google deems the search query to have local intent, a map with up to three local results will be placed in between the top ads and the ten organic results. Although no official percentages have been disclosed, it is estimated that up to 20% of all Google users click on the text ads, 35% do so on the local results whenever present, and the remaining 45% click on one of the organic results. Given how competive are many industries, ranking in one of the ten organic results is many times a lengthy and ardous process. 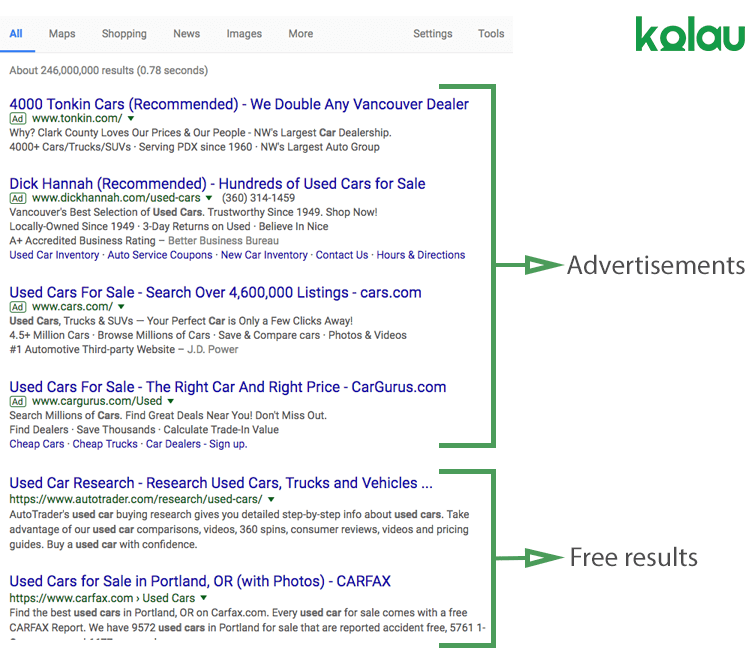 Google Ads -the 4 text ads on top of the results- provides for an immediate solution since the text ad can rank on top of them as soon as the campaigns are created. The reason why a higher percentage of clicks translates into a lower cost per click has to do with relevancy. Google wants to make sure that the more relevant ad copies are placed on top, even if they are paying less than its competitors. While the amount you bid impacts the position of the ad, so does the relevancy - so, get creative and write the best ad copy possible! Here comes the art of marketing - after all, not everything was going to be science! The more thought you put into writting a great ad copy, the more clicks it will get which translates into a lower cost per click overtime. 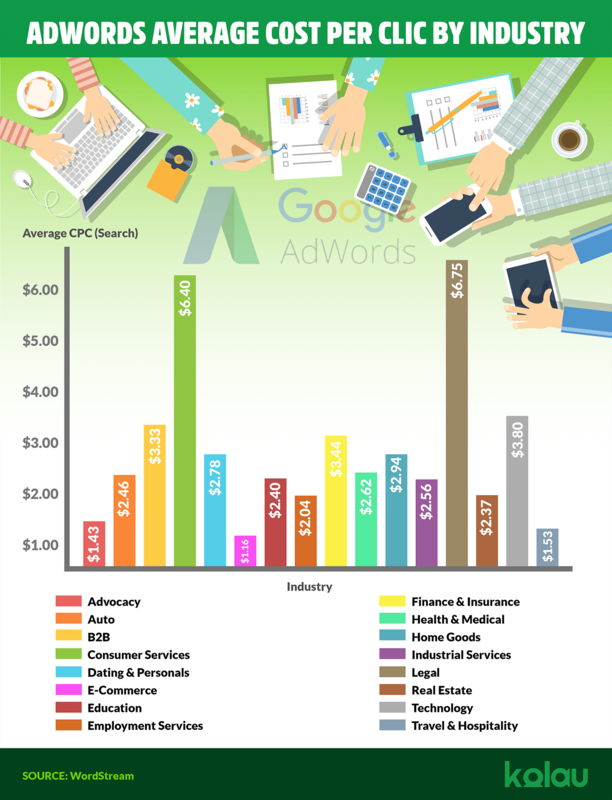 Google Ads, as we explain in another article, is one of the most cost-effective advertising platforms for small and big companies alike. The cost per click has remained stable throughout the years and although it somewhat varies per industry and country, it remains affordable given the high relevancy of the web traffic acquired and their higher-than-average conversion rate. Google Ads is the best channel to be found when your product is searched because over 90% of your customers search for it in Google.